Photo booth hire Eastbourne. Top of the range photo booth for your wedding, party or corporate event, fun is guaranteed. Photo Booth Hire Eastbourne for all your Weddings, Parties and Corporate events. If your planning an event in Eastbourne our photo booth is a must have! Our Photo Booth will guarantee a night to remember for you and your guests. Whether you are holding a corporate event, a Wedding, special party or just want to have a great time, we are dedicated to making your party a night to remember. The laughter it creates is amazing and everyone is sure to have the best night at your wedding or party! We will set up our high specification Photo Booth at your venue in Eastbourne and our fun and friendly booth attendant will make sure that everything runs like clock work. We will provide the entertainment so you and your guests can just have the fun. Unlimited HD Video’s with sound. Prints in colour or black and white. Lots of funfancy dress props are supplied. Upload your pictures straight to the Snap Shack UK Facebook, so your friends can start sharing right away! We can also provide Keyrings and a photo book at an additional cost. Contact us now for your personalised quotation to hire our Photo Booth at your event in Eastbourne. 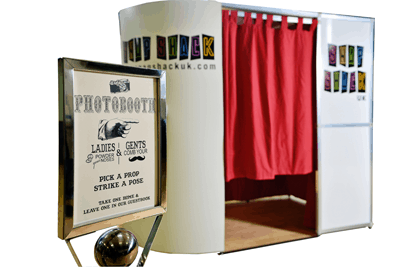 Snap Shack UK – Photo Booth Hire Eastbourne.